This month we added a complete set of data migration tools to help troops move from Troopmaster's Web 2.0 software. You can now move your entire membership roster, rank advancement, merit badges, special awards, leadership history, and training data to TroopWebHost, using files easily produced from TM Web 2.0. TroopWebHostGS added support for six new Girl Scout badges. Revised rank requirements that take effect August 1 were incorporated into TroopWebHost. You can now view the events for which a scout has been designated as a leader on the View Advancement page. Incomplete Internet Orders may now be viewed and updated for fundraising sales campaigns. 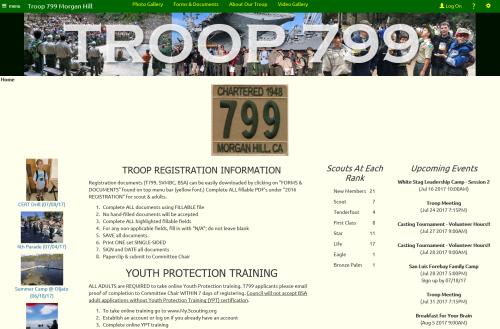 Troop 799 of Morgan Hill, California! We love the collage they put together for their banner image. They also made use of one of our newest widgets on the home page to display the current count of scouts at each rank.